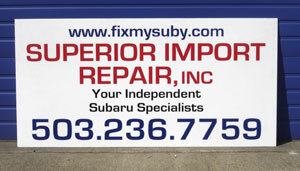 Superior Import Repair, Inc is an independent Subaru service, and repair facility. Superior Import Repair, Inc. and its staff are not affiliated, approved nor endorsed by Fuji Heavy Industries Ltd. or Subaru of America. Work performed is not guaranteed by Fuji Heavy Industries Ltd. or Subaru of America. Superior Import Repair, Inc is not authorized to do warranty work for Subaru of America. Go to www.subaru.com to find a dealership near you. YOU ASKED AND WE DELIVERED!!! Many customers at both locations have asked if we work on other vehicles, and the answer has always been well only if they have extra time. We are now proud to tell you about our new location at 7745 NE Sandy Blvd. We have taken over the Sports Car Center building, and are working on most makes and models of Asian Import Vehicles. This location is also more conveniently located on the Sandy bus line and close to shops and restaurants in the area. It is only a couple blocks up from the old location and easy to get to from 1-205 and 1-84. 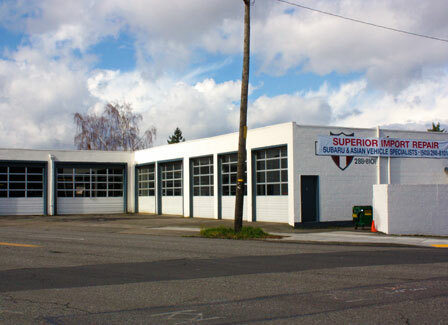 Superior Import Repair, Inc is a full service independent Subaru Repair shop committed to offering service superior to other repair shops at prices that actually make sense. We can help you with everything from oil changes to factory recommended services to engine repairs. For all of our repair services we offer a wide selection of Genuine Subaru Parts, OEM, Used, and Performance parts. Our lead mechanics are factory trained, including the owner who has been working at Subaru dealerships in the Portland Metro area since 1979. In addition, Superior Import Repair can help you buy or sell a Subaru. Whether it is with a Pre-Purchase Inspection (20% off by mentioning this website), helping you find a fair price for your Subaru, or keeping our eyes open for a Subaru that is just right for you, we will help you in all aspects of Subaru ownership. On occasion we even sell refurbished Subarus, and have been known to buy '92 and newer Subarus that need a little work. We also keep a large selection of used Subaru parts dating from 1985-1999. This onsite inventory at our Prescott location allows us to rapidly serve the needs of many of our customers. And if we don't have the right used part on-hand, chances are we know someone who does. Our family run business knows that the customer should always come first. We are never too busy to answer your questions or to advise you on vehicular issues. And with over 30 years of Subaru experience, you can rest assured that you will receive a superior experience. But don't just take our word for it; here's what a few of our customers have to say about their experience with Superior Import Repair. "Richie helped us find our Forester, and now takes such good care of it that we wouldn't even THINK of taking it anywhere else. We drive all the way from Corvallis just to find a Subaru mechanic that we can trust."